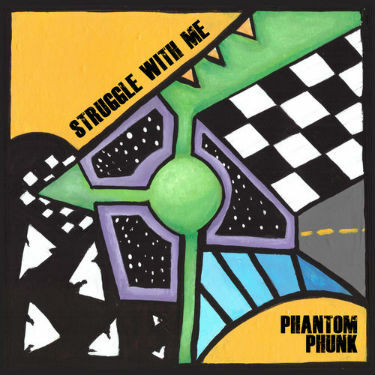 Struggle With Me is the latest EP from Tampa trio “Phantom Phunk.” Even though the band currently has three members, additional appearances are made on the album by rapper Cloud Master Price. Struggle With Me is an interesting release because it experiments with a combination of punk, neo-alternative, funk and hip hop. The first track, Mediphorical is my second favorite song on the album. It features a terrific, minimalist guitar presence and is fronted by the assertive vocals of Alexa Toro. The song is a great choice for opening track because the energy really gets the album off the ground. Every Where You Go gets into more experimental territory. It’s almost like if you mixed a hip hop jam with a Tegan and Sara song and somehow managed to make it work. No Hard Feelings makes creative use of timing and pauses to set up Toro’s vocals, which display a lot of echoey dynamicism in this song. Something Certain People Say is the best track on the album. It’s got a catchy chorus, the best guitar tone and has potential to be a legit indie hit song. Cheap Thrills is the loudest, hardest rocking song. Cloud Master Price makes another climactic appearance on this track and provides the link it needs to round out the album.